NEW YORK–Several months ago, Airbus and Arconic achieved a 3D printing first–the installation of a 3D printed titanium bracket on a series production Airbus commercial aircraft, the A350 XWB. Arconic, a global technology, engineering, and advanced manufacturing company, announced in September that it is 3D printing these parts for Airbus's newest widebody aircraft at Arconic's additive manufacturing facility in Austin, Texas. "Arconic is proud to partner with Airbus to advance aerospace additive manufacturing," said Jeremy Halford, president of Arconic Titanium and Engineered Products, in a company release. "Our comprehensive capabilities, from materials science leadership to qualification expertise, helped make this achievement possible. We look forward to continuing to advance the art of the possible in additive for aerospace." This first installation of a 3D printed titanium part on a series production Airbus commercial aircraft marks a milestone for additive manufacturing in aerospace. Although airplane makers have been using 3D printed parts for quite some time, largely for components inside the cabin, equipping airframes with metal parts produced via additive manufacturing is new. Airbus's installation of this 3D printed titanium bracket on a series production commercial airplane, as opposed to a test airplane, is said to mark a significant step forward in the qualification of more complex 3D printed parts for production aircraft. 3D–printed parts, including metal printed cabin brackets and bleed pipes, are already flying on Airbus A320neo and A350 XWB test aircraft. 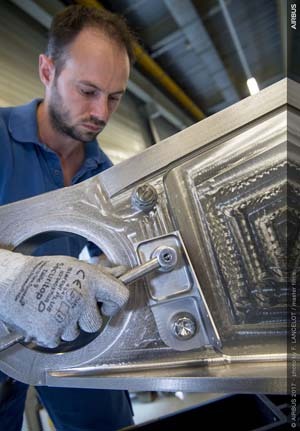 The 3D printed titanium bracket is part of an ongoing partnership between Airbus and Arconic. In 2016, Arconic (www.arconic.com) announced three agreements with Airbus to produce titanium and nickel 3D printed parts for commercial aircraft, including the A320 platform and A350 XWB. Arconic's 3D printing technology capabilities include laser powder bed and electron beam processes.